Take a journey through the self with Sivan 6-Piece Yoga Set! At 12mm, this yoga and pilates mat is a full 1/2″ thick and is one of the thickest mats on the market! The mat features specially designed memory foam offering superior impact absorption and comfort. 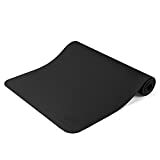 Thick enough to protect your knees and joints while still allowing you to grip the floor for balance, its non-skid ridges will ensure that the mat never slips during use. The extra large dimensions (71″ x 24″) ensure complete comfort for people of all shapes and sizes. Constructed from durable and long lasting NBR foam, this mat is ideal for all types of yoga, especially restorative poses. Additionally, the mat features an integrated carry strap for your convenience and wipes down quickly and easily. Provide support and balance with our durable foam yoga blocks and deepen your stretch with our 6.5ft yoga strap that allows for better extension of the body. Our 68″x24″ and 30″x20″ yoga towels are designed with microfiber technology and prime absorption to provide slip-resistant and sweat-free workouts. A great set for yoga, pilates, stretching and toning workouts. Be kind to your body and treat yourself to the Sivan 6-Piece Yoga Set, the ultimate set for any style of yoga! Package includes: 1/2″ NBR yoga mat, 2 yoga blocks, 1 – 68″x24″ yoga mat towel, 1 – 30″x20 yoga hand towel, and 1 yoga strap.